LANCASTER – Calling all area motorcyclists! You’re invited to participate in a motorcycle ride through the Antelope Valley in honor of California officers who made the ultimate sacrifice and the families they left behind. The inaugural “Ride for the Fallen, Families left behind” Memorial Poker Run will take place on Saturday, July 20, 2013. Registration takes place from 9 to 10 a.m. at Antelope Valley Harley Davidson, located at 1759 West Avenue J-12 in Lancaster. The cost to participate is $25 per rider and $30 per couple, with 100 percent of the proceeds going to the Organization for Families Left Behind. 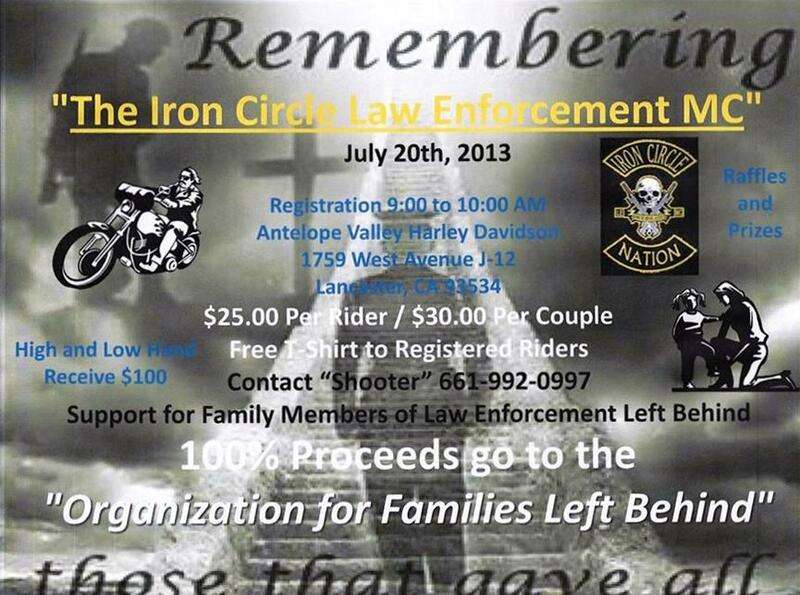 The event is presented by the Iron Circle Law Enforcement Motorcycle Club to promote riding and to help support the families left behind by fallen heroes. 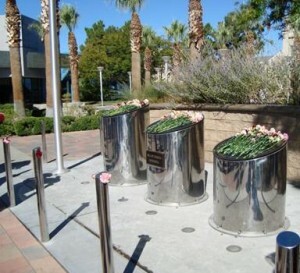 The event is sponsored in part by Antelope Valley Harley Davidson. Assemblyman Steve Fox will also attend and assist with rider registration, organizers said. 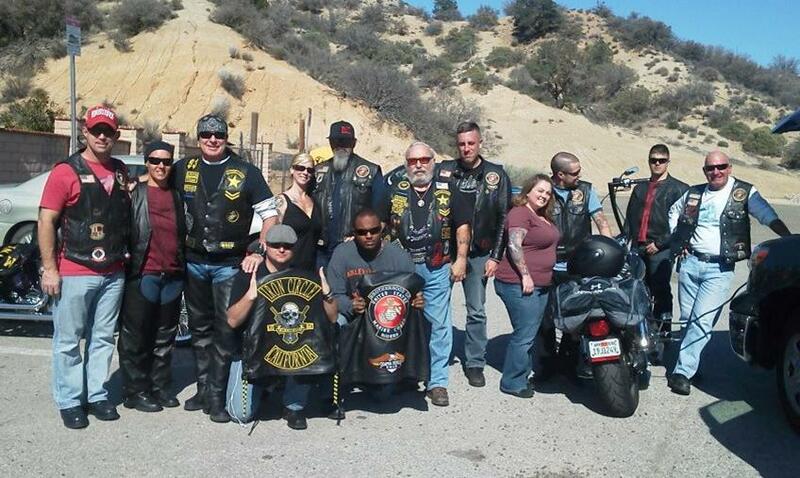 The motorcycle ride, led by Ron Emard, starts at Antelope Valley Harley Davidson and goes to Charlie Browns in Littlerock, La Cabana Restaurant in Acton, The Rock Inn in Lake Hughes and ends at Foxy’s Southwest Steakhouse on 60th street west and Avenue G, where there will be a live band. Raffle prizes, including a gun safe, two guns, hotel stays and dinners, will be given away. For more information on this event, call Shooter at 661-992-0997. View a flyer for this event here. 3 comments for "Local “Ride for the Fallen” set for July 20"
To Honor a friend, family member,or just the citizen that exceeds in your community is the absolute right way to respect their life. Everybody deserves this if they made personal sacrifices to someone else’s betterment. But to not hold our government accountable for the misuse of our tax dollars is just flat wrong. Lets do the math repay our returning Vets by Creating a life that respects their sacrifice, and help them try to return to a normal life. Or send Millions of tax dollars to Counties that most people have never heard of. Now if it took longer than two seconds to form an opinion on this then you wouldn’t understand anyway. I don’t care if your a donkey or an elephant your American and we don’t leave them behind and we should give them all the support they gave us. Thank our founding Fathers and show them the respect they deserve on this day. Think about what that small group of men did. This is a wonderful thing to do for those that have lost a loved one. I wish events like this would occur to help the young men and women that have lost limbs in service to our country. They have need homes that are adapted and accessible for their individual needs and disabilities.